If you’re like me, you are probably wondering why you should give an extra $700 for the Phantom 4 Pro or around $350 more for the Phantom 4 Advanced. And I am going to try and answer this question by outlining the main difference between the two (DJI Mavic PRO VS Phantom 4 Pro). In perfect conditions you will get around 30 minutes of flight time for the Phantom 4 Pro and Advanced and 27 minutes for the Mavic Pro (as advertised). However this may vary depending on the flight conditions. In theory the flight time difference should remain the same between the two. If you try and compare their ability to fly, you could say that they are quite similar and there aren’t such noticeable differences. Although a thing to note is that the Phantom 4 has a bit higher speed top speed, so if you care about that, you might consider this as a slight difference. When you buy a drone, you can use it as it is if you want, but you aren’t going to use it to it’s full potential, so this might be a good way to decide if you are going to buy one or the other. 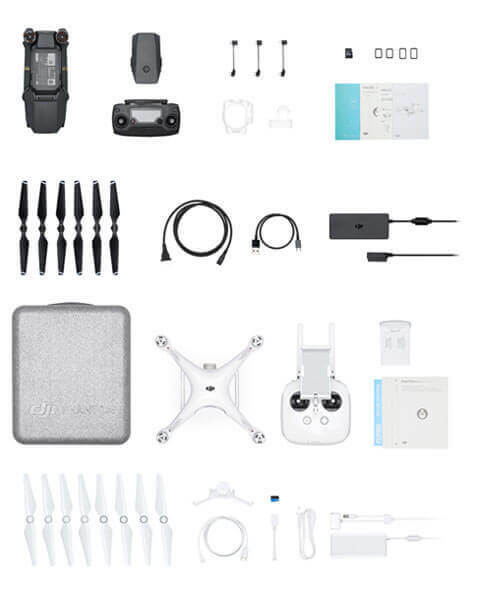 The DJI Phantom 4 Pro accessories cost a little more than the Mavic Pro accessories. With the list we made (extra battery, charging hub, ND filters), you can save around $200-$300 depending on what you will buy with the Mavic Pro. Now here is where the differences might matter a lot to you depending on what you want he drone for. 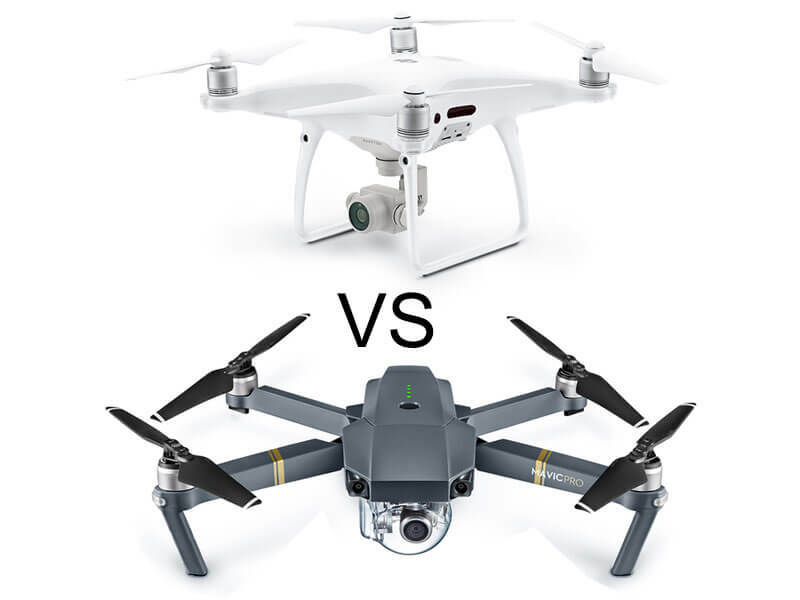 Both have quite decent cameras, but there are some noticeable quality differences and if you are going to use the drone for professional video or image shooting, then I’d recommend choosing the higher quality. The Phantom 4 Pro clearly wins here, the clarity of the images and the videos seem quite superior to the Mavic 4 Pro. In lower light cases, the Phantom 4 Pro has a more smooth picture quality. Meanwhile the Mavic 4 has a lot of artefacts and it can ruin a picture. The Phantom 4 Pro has a much bigger controller and it has a very bright screen which can be very useful in sunny conditions. The Mavic Pro has a smaller controller that can fit very well into your hands and it’s quite light. You can charge it through the micro USB port and it has a more reliable connection to the drone. So here you should pick higher quality with brighter screen, or the smaller and more comfortable controller. 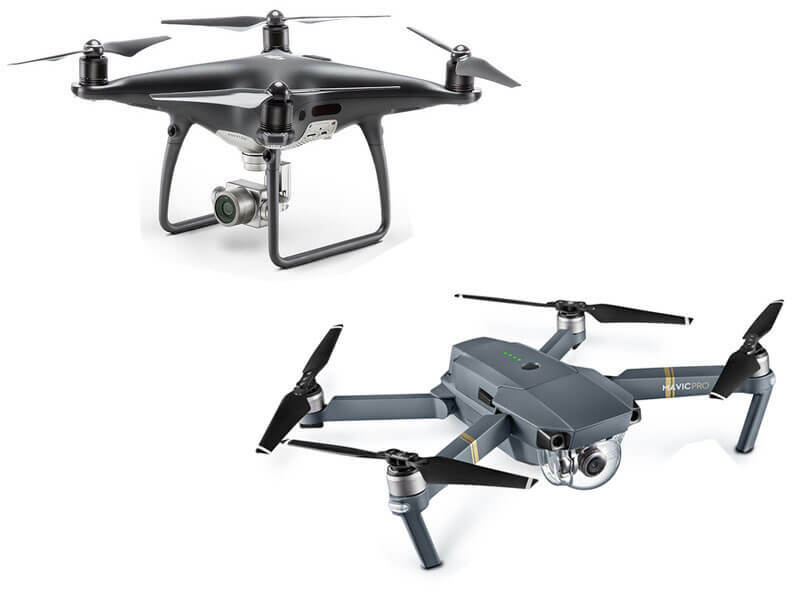 There are quite some big differences between the DJI Phantom 4 Pro and the DJI Mavic Pro. But as a summary, you could say that you should get the Phantom 4 Pro only if you got the extra money and if you want to use it professionally. If you don’t have the extra money and you don’t want to use it professionally (necessarily), then you should take the Mavic Pro. In general if you want something professional, you should save some more money and just go for the quality. DJI Phantom 4 Pro Price: $1500. DJI Mavic Pro Price: $1000.